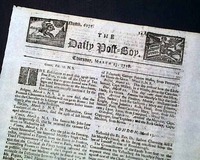 Shop original newspapers featuring both famous and infamous women in print, along with other noteworthy news involving women and items of female interest, arranged in chronological order - most recent first. 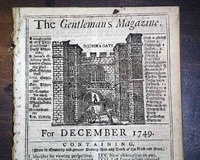 THE GENTLEMAN'S MAGAZINE London, September, 1773 Near the back is a printing of a poem titled: "On Recollection" which was written by the famed black poetess Phillis Wheatley. 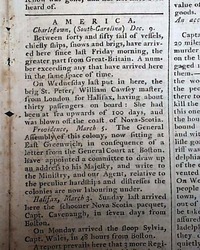 This piece also includes a brief biography of her. 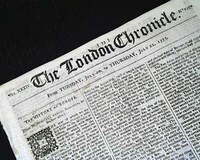 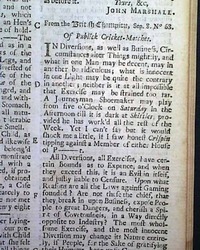 THE LONDON CHRONICLE, England, July 22, 1773 Pg. 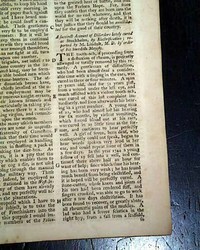 3 has a fascinating letter from New York concerning a woman challenging a man to a duel to protect her own honor (see). 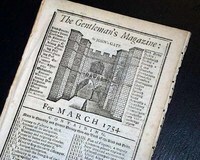 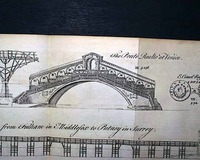 THE GENTLEMAN'S MAGAZINE, London, March, 1755 Among the articles within are: "A Succinct Account of Disorders lately cured at Stockholm by Electrification..." "Origin of Chivalry from Voltaire" "A Female Impostor in France Detected" and so much more. 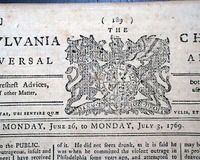 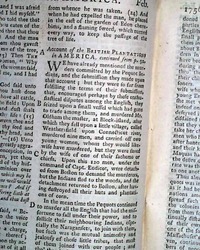 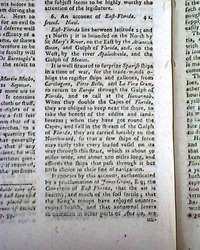 THE GENTLEMAN'S MAGAZINE, London, England, July, 1751 The first article, taking two pages, is: "A short Account of the Island of Minorca...". 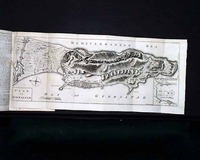 The following page has a print of: "...a Gaulish woman's head-dress..." (see photos). 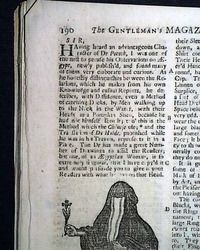 Within this issue is an interesting & unusual engraving showing the traditional garb of an Egyptian woman, with related text (see photos). 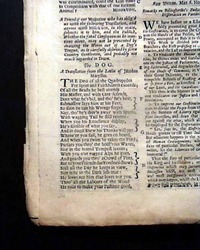 Over 3 pages are taken up with a detailed article: "
One of the articles is titled: "A Dissertation Whether the Hebrews borrow'd any Customs from the Heathens? 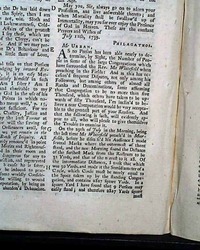 And Whether Temples were before the Tabernacle?" 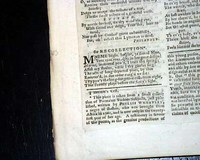 which takes most of a column. 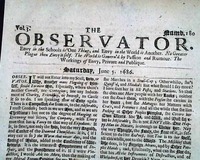 THE OBSERVATOR, London, England, 1684-1686 A dialogue newspaper founded by Sir Roger L'Estrange, a Tory pamphleteer, as a vehicle for attacking dissenters and Whigs. 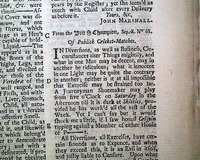 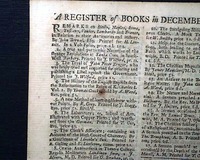 This early singlesheet newspaper has the old style type making it great for framing (see photo) particularly with the over 300+ year old date clearly visible in the dateline. 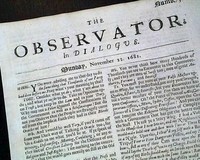 THE OBSERVATOR, London, England, 1682 A dialogue newspaper founded by Sir Roger L'Estrange, a Tory pamphleteer, as a vehicle for attacking dissenters and Whigs. 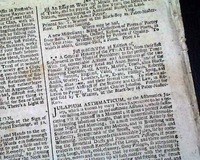 This early singlesheet newspaper has the old style type making it great for framing (see photo) particularly with the over 300+ year old date clearly visible in the dateline. 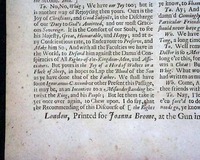 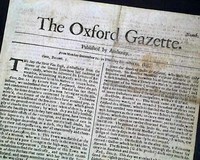 THE OXFORD GAZETTE, England, Dec. 14, 1665 This is an extremely famous--and rare--title, being the predecessor of the famous "London Gazette", the oldest continually published English language newspaper in the world. 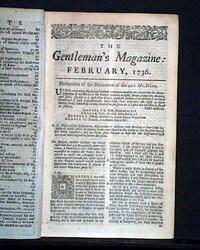 Plus this is the #9 issue.